The Weinberg Memorial Library is a wonderful University resource available to the greater Scranton community. On a daily basis the library welcomes Scranton area residents and every year hundreds of books are checked out by community members, including: Lackawanna County Public Library patrons, Friends of the Weinberg Memorial Library, Scranton Preparatory School students and local University of Scranton Alumni. The mission of the library is to provide information, services, and programs that meet the current and anticipated educational, research, and public service needs of the University community and the community-at-large. Explore the information below to understand how you can access the library’s extensive offerings, collections and services and visit the library’s website. Library hours differ depending on the time of the academic year. Please visit the Hours and Location page for the most current schedule. The Library’s GPS Address is 900 Mulberry Street, Scranton, PA 18510. Directions to the Library: from I-81 Exit 185 (Central Scranton Expressway), follow signs to campus (on right). Before the first traffic signal, turn sharply right onto Madison Ave. Proceed 2 blocks and turn right at the light onto Mulberry St. After 1 block, turn right into the main entrance (level 2) of the Parking and Public Safety Pavilion, and park in Visitor Parking. Campus maps and visitor parking permits are available in the Public Safety Office on level 2. Exit the Parking Garage on foot heading towards the DeNaples Center. The Library is the gray building to the right of the DeNaples Center. All Lackawanna County residents with a valid library card can obtain a Weinberg Memorial Library card. Prospective borrowers must register at the Circulation Desk to obtain a University of Scranton Library card. The first time a user borrows materials, the barcoded ID is activated at the Circulation Desk. In addition, the Weinberg Memorial Library provides borrowing priviledges to students of Scranton Preparatory School. University Alumni are provided with lifelong borrowing privileges. For Friends of the Library privileges see below. Report lost cards immediately, as you would with a credit card, to prevent charges being made against the account. Reference books, and current and bound periodicals do not circulate. "In-Library use only" materials must be returned to the Reference or Circulation Desk before the Library closes. Most media materials do not circulate and must be used in the viewing/listening area. Music CDs, if not on Reserve, may be charged out for 3 days. Only currently enrolled students and affiliated faculty and staff may request interlibrary loan and access licensed databases from outside the library. For additional information on Fines, Hold Requests, Loan Periods, and more, visit the Library’s Borrowing and Lending Policies page. The “Friends of the Library” is open to any interested person. Friends of the Weinberg Memorial Library are entitled to unlimited borrowing privileges, invitations to Library programs and special events, preview of book sales, receipt of "Information Update," the Library newsletter published in the Spring and Fall, special bookplates for any books donated to the collection, and the opportunity to volunteer for work in support of Library programs and services. Friends Student Members are entitled to borrow a total of five (5) books and enjoy the other benefits of membership listed above. Visit the Friends of the Library page for more information. 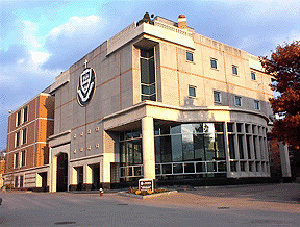 The University of Scranton provides computer access to the public for research and educational use only. Leisure use of the computers—games, chat, social activities, loading or downloading programs—is prohibited. Guests may use the computer for one hour, even if other machines are available and no one is waiting. Members of the public may only use the three computers designated as "Public Terminals." These computers are located on the Second Floor on a round table. Any member of the public using a password protected computer will immediately be asked to leave the building. Infraction of any of these policies will result in the loss of a guest’s use of the Public Access computers.